The entire shape of our worship space has recently been renewed. Instead of the congregation sitting in rows like at a concert, everyone is now seated on either side of a new focus for worship down the length of the church. We also move around the building during our worship. Both the seating arrangement and the movement in worship make the experience very participative. We have installed lighting along our liturgical axis whichis a straight line from front to back, starting at thefont, moving to the ambo, and finally to the altar. This lighting is very flexible both in terms of intensity, and colour. It also creates a dramatic atmosphere for our worship. We are very grateful for the support given to us by the Very Revd Richard Giles acted as our consultant during the process of change to both our building and our worship. Richard has written several very well received books including Re-pitching the Tentand Creating Uncommon Woship from which we have taken great inspiration. Richard was formerly Dean of Philadelphia Cathedral. 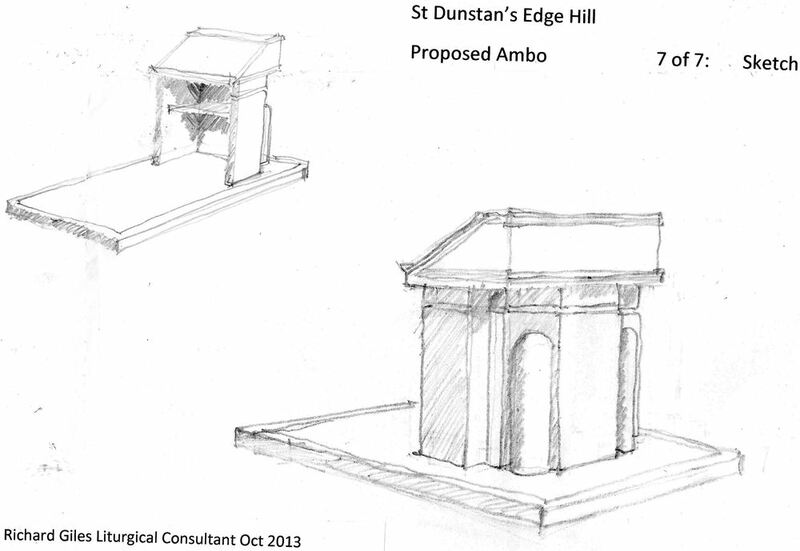 He has designed a new altar, and new ambo/lectern for us. Below are Richard's sketches which show what powerful pieces they are. There is also a picture of our beautiful font which until now has been tucked away at the back of church in a rather inaccessible baptistry. We will be moving the font into the nave of the church so that we can all gather around it. We will be using the font at every main act of worship as a reminder of being washed in the waters of love and forgiveness, and of our common identity as a community of the baptised.